What can I say about Chris? His blog Nibble Me This was the first blog I read (and knew it was a blog, I probably stumbled on some before that but didn’t know what a blog was or how it worked) and was the first blog I started actively following. In fact, he was the inspiration for me starting up Griffin’s Grub. So you have him to thank for that…or to blame depending on how you see it. I have learned a wealth of information from all of those sources but my best learning experiences have come from the University of Fire, Trial, and Error. And that is what lead to starting this blog. Nibble Me This is a collection of my culinary misadventures in live fire cooking. Honestly, don’t you think the best way to learn something is to screw it up extraordinarily and then realize, “Wow, I won’t do it that way again!”? I look forward to the next adventure, the next challenge, and yeah, even the next failure. 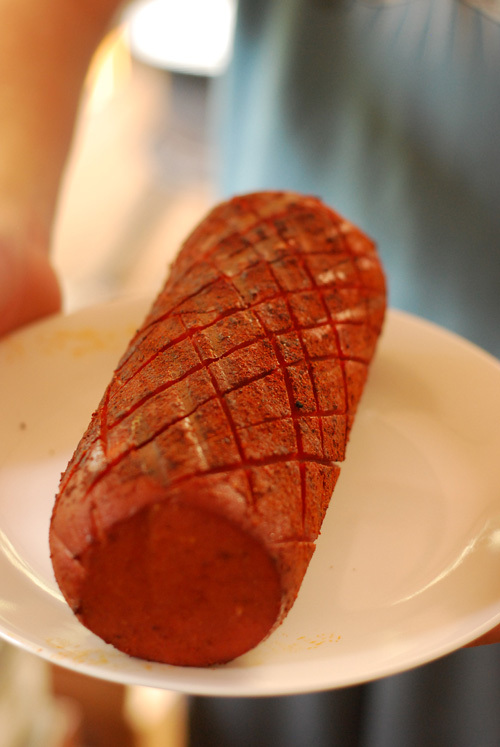 In this post, Chris (and his son, Trevor) tackle something I have not yet tried…smoked bologna or simply ‘loney as its called in the barbecue world. I’ve wanted to try this for awhile, but was always unsure of where to find a chub of bologna that wasn’t already sliced up. Guess I’ve got no excuses now. So if you want to see a true pitmaster and one of my idols in person, read on and then make your way on over to Nibble Me This. 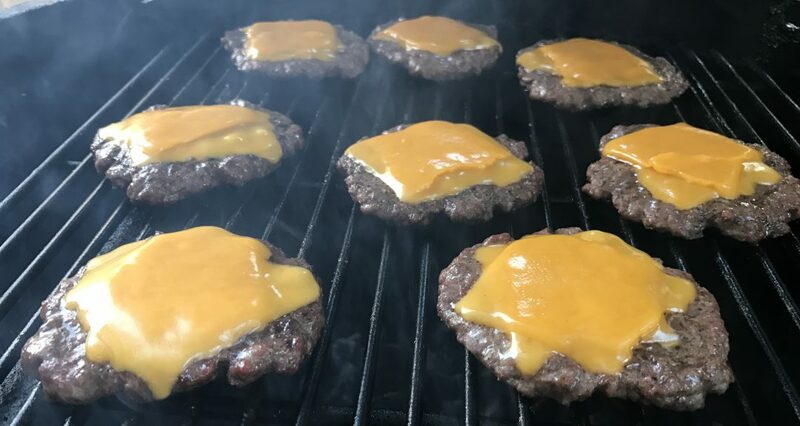 If you can’t find something that is calling your name to try on your grill or smoker, then there must be something wrong with you. When my buddy, Griff, asked for a few folks to guest post while he is traveling I was glad to volunteer. We Eggheads have each other’s back. Last week was “back to school” week here and Trevor (12) asked if he could smoke bologna to take for sandwiches that week. 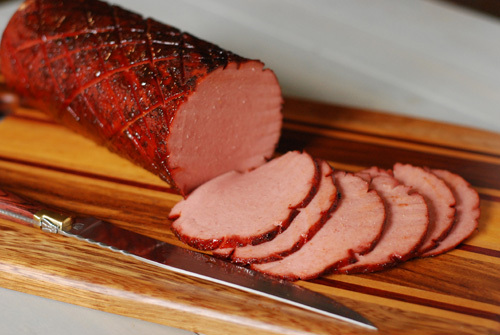 If you have not had smoked bologna, then you have never had bologna at its best. The smoke and spices form a crispy outer edge that amplifies flavor. Yeah Oscar Meyer, my bologna has a first name, it’s S-M-O-K-E!Plus, it is the easiest thing in the world to smoke. You can smoke it on a ceramic grill, a kettle grill, or even a gas grill set up with a foil pack of wood chips. This was one of the first things Trevor learned to smoke back when he was 8 or 9 years old. Trevor smoking bologna in 2009. 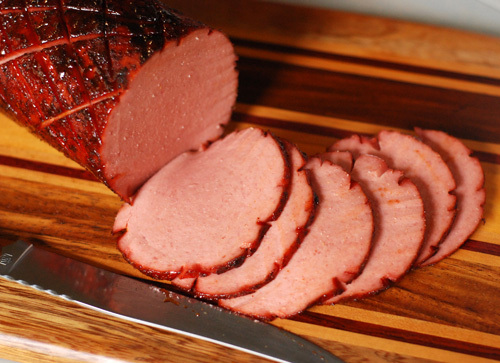 You should not have a hard time finding a “chub” of unsliced bologna, most grocery stores carry them in their lunch meat section. Some are whole and covered in red plastic. Others are sliced into 1 or 2 lb chunks. Either way works. Note, the measurements given are approximate. This is more of a “by sight” kind of thing, you are going for covering the entire outside of the chub. 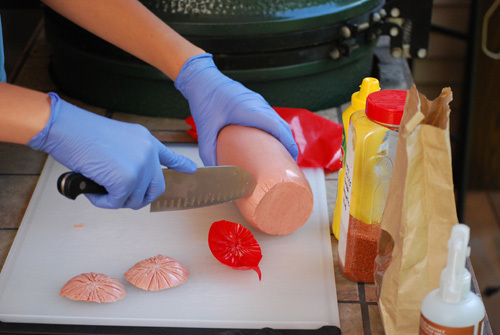 Use a sharp knife to score the bologna in 1″ intervals. Start at one end and work a diagonal line about 1/4″ deep to the other end. Move the knife 1″ over and repeat. Don’t stress out on it being perfect. You’re going to slice it in the end anyway. 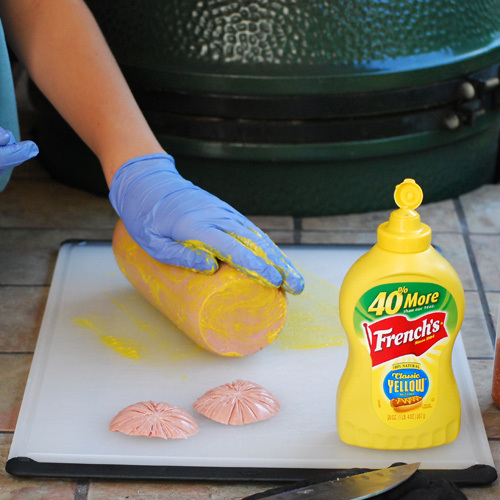 Slather the bologna with the yellow mustard. Nothing fancy here, you don’t need dijon, coarse grain, or brown mustard. Plain cheap mustard works the best for this. We just squirt it on as we go and rub it all over. I’d guess it is no more than a 1/4 cup. Apply the rub to the chub! 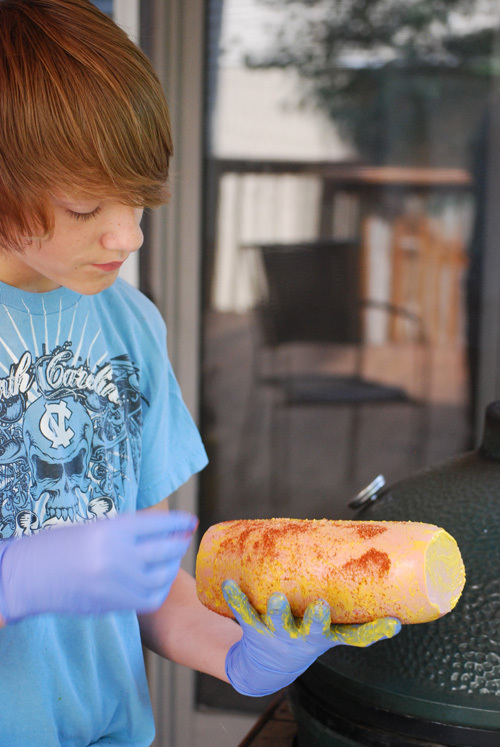 Trevor used a rub recipe called Wild Willy’s Number Onederful rub but any general purpose BBQ rub should do fine. You want to cover the rub all over and rather heavily. Smoke it. Place the rubbed chub on the grill and cover. Let cook for 1 hour. Glaze it. Use a pasty brush to lightly coat the chub with BBQ sauce. We like to use a sweet sauce for this and today we used Blues Hog original BBQ sauce. Let smoke for another 30 minutes and it is done. For smoke we used a block of Mojobricks Hickory Mojo-cubes. 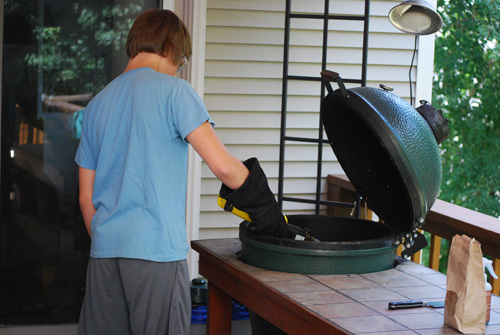 Firing up the Egg with a torch and wearing the required safety glasses and gloves. Scoring the chub. You don’t have to cut off the ends, Trevor just likes it that way. He started seasoning it by sprinkling it with rub. 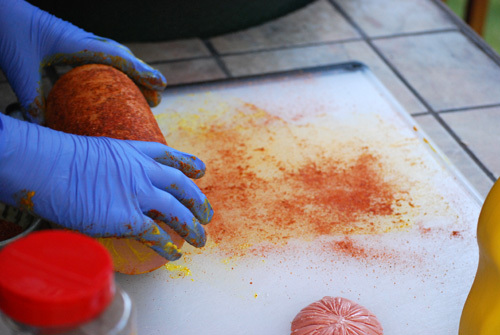 But then had the idea of sprinkling rub on the cutting board and just rolling it on thickly. I saved some of the shavings from slicing it up and I’m thinking of crisping them in a saute pan (like bacon) and then making carbonara…or is that “bolognara”? I love baloney and I will be making this gourmet item. Thanks for the recipe. Terrific. I find baloney a bit boring but this definitely adds a bit of ‘interest’! This looks delicious & can’t wait to give it a try. I have a little 5 month old junior pitmaster and this post has me chomping at the bit to get him going! Congrats on introducing your son to a lifelong hobby. I loved the shot of him firing up the egg with safety goggles. Yes, sorry, comment meant for Chris. I’ll check him out. Inspiring stuff for a new dad! That is so cool. I’m a fan of bologna, always have been, but have never considered slapping it on the grill. I’m headed over to Chris’ page. Hope you’re having a stellar time in Germany, Jason!